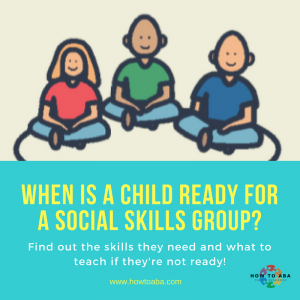 When is a Child Ready for a Social Skills Group? Social skills should always be an integral part of any good ABA program right from the start. By social skills, I don’t just mean being able to play with other kids. In typical development, socializing starts very early – a baby making eye contact with his mother, a toddler pointing out an interesting sight to her caregiver, or a child being able to point to or gesture towards what they want. When is a child ready for a group setting? At some point, children are able to transition to learning social goals in a group setting. Although parents are often eager to get children into a social skills group, there are some pre-requisite skills that the child should have before participating in group activities. If done too soon, we run the risk of the child being overwhelmed, showing negative behaviours, or being lost in the crowd. Does the child allow peers into his space? Tolerating peers playing near a child and even tolerating other children touching their toys and items is an important part of being part of a group. If being near other children is going to elicit negative behaviour than the child may not be ready for the group environment. How can you get him ready? Teach him to tolerate adults in his space and touching his toys, then slowly generalize to other non-threatening children (eg: siblings) then eventually peers. Can the child successfully sit and engage in independent leisure activities? Being part of a group means that the child must be ready for some independence. If a child still requires 1:1 support to be able to safely and appropriately navigate a room and entertain herself, then a group setting may not be the optimal learning environment. How can you get her ready? Teach her independent leisure skills and how to follow a visual schedule. This is a skill that she can take with her anywhere! Can the child attend to a group activity or lesson? To be able to learn in a small group environment, a child must be able to sit and for an age-appropriate amount of time without constant intervention or prompting. Even if the child can sit quietly, you would also need to make sure that he is attending and actually absorbing any lesson or instructions that are happening in a group. How can you get him ready? Teach using a “Small circle time” program taught in a 1:1 setting. With proper prompting and reinforcement, teach him the skills that he would require in a small group setting. Does the child display any aggressive or stereotypical behaviours? In order to be around peers, the child and children around her must be safe. If a child is aggressive, this is often a no-go for a small group setting. We want the group setting to be a positive experience and if it becomes aggressive or inappropriate, both the peers and the students will not feel very positive about it. How can you get her ready? Get the behaviours under control. Teach skills like: keeping hands to self, calm and quiet body, and functional communication. Ease her into the small group, even if she can only tolerate being appropriate for a few minutes at a time – that’s okay! It’s better to start small and slowly increase than to try to overachieve and have to back off. If you find that you’re constantly doing “damage control” and putting out fires for your kiddo in a group setting, he may not be ready. You would likely be better off by teaching some of the pre-requisite skills in a controlled 1:1 environment and then slowly generalizing to a group setting. This entry was posted in ABA, Behaviour, education, social skills, special needs, teaching. Bookmark the permalink.